Over a year ago, while at a church flea market, I came across the DVD for a TV program titled Hauntings, and ever since then it’s been sitting on a bookshelf in my office, tempting me to pop it into the player. Well, today I finally gave in. 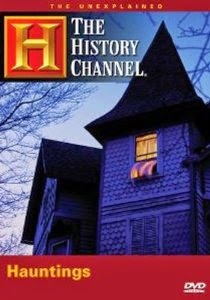 An episode of The Unexplained, a series broadcast on A&E’s The History Channel between 1996 and 2000, Hauntings features three supposedly authentic supernatural events. The very night that Tom and Linda Brown moved into a small home in East Peoria, IL, they started hearing noises in the basement, as if someone was down there throwing boxes to the ground. Tom went to investigate, yet found nothing unusual. Things grew stranger as the weeks wore on, with doors slamming shut and phantom footsteps making their way across the kitchen floor at night. When Tom spoke with a neighbor of theirs, whose parents built the house, he learned the woman’s father, Stuart Walls, killed himself in the closet of one of the rooms and died before he could utter his final words. According to Rob Conover, a paranormal investigator the Browns called in, Stuart never did leave that house. Even more terrifying is what happened to Beth Batzel, who, after remarrying, relocated to a home in New Jersey with her husband and 3-year-old-daughter from a previous marriage. Once there, she was tormented by an unknown entity (during a séance, the spirit identified himself as George Baxter, who bought the house in 1872 and wants to be left alone, telling the Batzels “It’s my land, and you get out”). After 4 years of hell, which included threats written on the wall in red lipstick, the Batzels moved to an apartment in Clinton, NJ. Only the haunting didn’t stop. From 1972 to 1985, the family moved 11 times, and in every instance they were plagued by ghosts. Before long, Beth Batzel came to the horrifying conclusion that she was a “magnet”, drawing spirits to her from the other side. Many hauntings revolve around a building, but in her case, she was the one who was haunted. These two tales, as well as the story of Steve Lee, a single father of three boys whose log cabin may have been built over top of a portal to the spirit world, make up the bulk of Hauntings, which offers authentic photographs and, in a few instances, actual audio and video recordings some believe are proof positive these events were supernatural in nature. To the filmmaker’s credit, they also include expert analysis from those who support the claims of ghostly presences, and those who refute them. Leon Lederman, a Nobel Prize winning physicist, doesn’t think spirits are real, calling them the delusions of either “gullible people or dishonest people” and adding, quite emphatically, that “science has no room for ghosts”. Not true, says psychologist Karl Schlotterbeck, who worked with Beth Batzel and came to believe her story. He’s absolutely convinced Beth was attracting malevolent spirits (though he concurs science can’t actually prove this theory). By including testimony from both sides, Hauntings does more than just tell a few good ghost tales; it gives us something to think about. In the end, there’s nothing in Hauntings we haven’t seen before, and odds are it won’t change anyone’s mind. Believers will walk away still believing, and skeptics will continue to doubt. As for me, I believe, but only because I experienced my own brush with the supernatural in a house my wife and I lived in for six years. Mind you, I never actually saw a ghost, yet every now and again, someone or something would make its presence known, as if to tell us it was there... watching….